Our brilliant concept map of the US allows visited destinations to be scratched off, revealing the beautifully styled up to date USA poster map underneath. 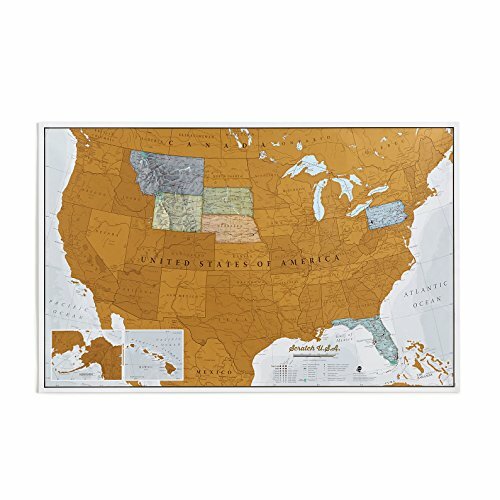 The perfect wall map poster gift for travel enthusiasts, the scratch off map design allows complete personalization of the large map of the US to display a unique travel story. Just grab a coin and scratch off all the states you've visited, creating your own personalized, continually changing USA wall map. The scratch off USA map features states, National Parks and cities, making the perfect travel map - scratch off your favorite spots! The Scratch Off USA Map is printed on high quality silk art paper with a gloss coating for luxury and the scratch off travel map works exactly like a scratch card - once the gold coating is removed it reveals the map underneath. The USA wall map measures 34 (w) x 22 (h) inches - please note that the size was changed in December 2017. Therefore any comments about other sizes relate to maps purchased prior to that date. The size now being shipped is 34 inches wide x 22inches high and will fit a standard frame of that size. Frame not supplied. Your scratch off map of the US is supplied rolled in a secure, protective tubed packaging for crease free delivery and immediate display. Maps Internationalcreate beautiful and geographically precise maps that inspire and encourage learning about the world we live in. USA SCRATCH OFF MAP: Scratch off states visited - map gold coating is removed to reveal colored US states, National Parks and more underneath. LARGE MAP: Wall world map poster measures 34 (w) x 22 (h) inches - the big world map has boundary outlines on the gold coating and cartographic detail underneath. UNIQUE TRAVEL GIFT: This scratch off map of the USA is ideal as a gift for anyone planning a road trip - more than just a USA map - scratch off your destinations! CREASE-FREE DELIVERY: Your scratch off US map is made of silk art paper and is rolled in a tube for delivery, so it arrives ready to display.